If you’ve been looking for a fun and unique way to spice up parties you host in your house, apartment, or dorm room, we’ve got just the thing. 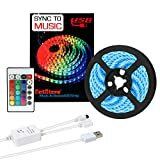 The DotStone Music LED Strip Light is a very cool lighting accessory that people have been going crazy over lately. It comes in three different lengths — 2 meters, 5 meters, and 10 meters — and you can stick them anywhere you want just like any other LED light strips. The feature that sets them apart is a special mode that makes them flash in sync with the beat of whatever music you’re playing. It’s a very cool effect, and these strips are in stock now on Amazon.